Born in Cologne, Franz Seiwert was severely burned by a radiology treatment in 1901, and for the rest of his life feared he would die at a young age. From 1910 to 1914, he attended the Cologne School of Applied Arts, and afterwards he worked for an architectural firm. 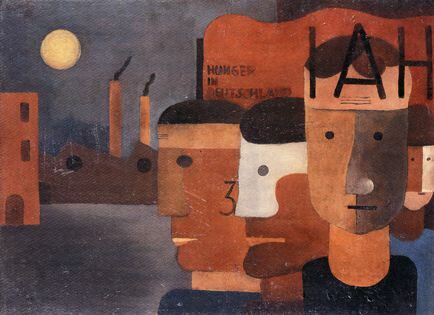 He founded the Gruppe Progressiver Künstler (Progressive Artists Group) with Heinrich Hoerle in 1919. In 1921, Seiwert completed several prints for the magazines Der Strom (The Stream) and Die Aktion. Also during this year, he formed an acquaintanceship with the artist Max Ernst and the photographer August Sander. By 1922, Seiwert was fairly well known in both Germany and America, where he had had an exhibition in Detroit. Ten years after the founding of the Gruppe progressiver Künstler, Seiwert founded its publication, From A to Z, which he edited until its final issue in February of 1933. That same year, Nazi threats forced Seiwert to temporarily flee to the mountain range Siebengebirge. Shortly thereafter, he died from the incurable radiation burns he had received as a child.